Gaining Ground launched a Local Recipe Food Challenge during the month of August on their Facebook page. 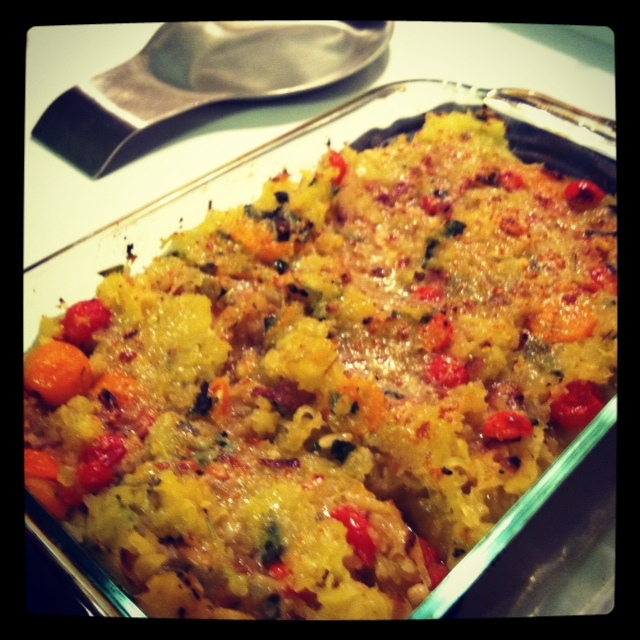 This deliciously local recipe was submitted by one of our Battleground CSA members. Cut Spaghetti Squash in half lengthwise, and remove seeds. Place both halves, cut side down on a rimmed baking sheet. Add ¼ cup of water to the pan. Bake at 375 degrees until squash is soft when pressed (40 min-1 hour). While squash is baking, sauté red onion, zucchini, garlic and pine nuts with a teaspoon of olive oil over medium high heat for 5-7 minutes. In a large bowl, combine sautéed onion, zucchini, garlic, pine nuts with tomatoes and basil. Add 1 Tbsp. of olive oil and salt and pepper to taste. Add in browned local sausage, if using. Remove spaghetti squash from oven and scrape with a fork to form strands, while it is still warm. Add spaghetti squash to the large bowl of ingredients and stir to combine. Place all contents in a casserole dish. Sprinkle with parmesan cheese and place under the broiler for a few minutes to melt the cheese and slightly brown the veggies. Garnish with fresh local basil and enjoy!